Boeing and TUI Group, one of the world's largest tourism/holiday companies celebrated the delivery of the operator's first 737 MAX 8. It is hoped the aircraft e will play a key role in TUI Group's ambition to operate Europe's most carbon efficient airlines and regain profitiability for the group. 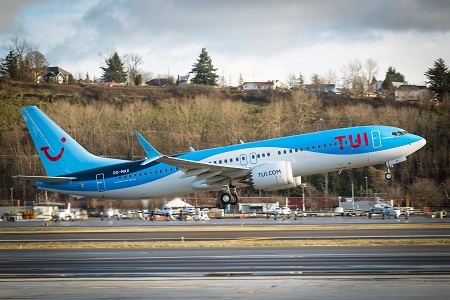 "The 737 MAX is a great fit for TUI Group, with 14 percent lower carbon emissions and a 40 percent smaller noise footprint supporting its airlines commitment to sustainability," said Monty Oliver, vice president of European Sales, Boeing Commercial Airplanes. "We are honored by TUI Group's continued confidence in our products and look forward to the many MAX deliveries that lie ahead." TUI Group has 51 additional orders of the 737 MAX 8 and four 787 Dreamliners. The Group also has 18 unfilled orders for the 737 MAX 10 and was the first European operator to select the latest and largest member of the 737 MAX family of aircraft.